What a great time of year for creating slideshows to share with others. Whether it's a wrap-up of the holidays, or the entire year, these short videos are a perfect way to tell your story. If you're an iPhone shooter, you have a robust slideshow editor on your laptop that can tap into all of those great images on your phone. Photos for macOS makes it easy to author and share these presentations. And if you want to take your movie to the next level, customize your title screens using this simple tip. Here's a video that walks you through the steps. 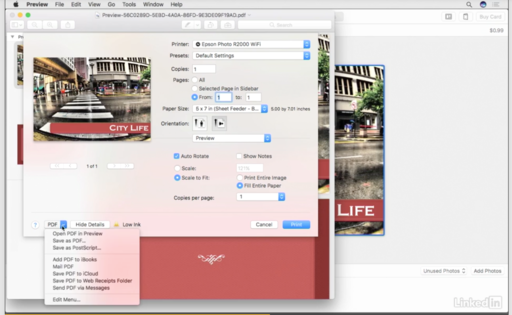 That's right - the greeting card tool in Photos for macOS can also be used for creating professional title screens for your slideshows. And everything you need is right there under one roof. Instead of printing the card, you output it to digital and add it to your presentation. The look absolutely great because you have all of the high-end design tools in the greeting card creator at your disposal. Output to digital to use your design in a slideshow. A few of these handsome titles will make your video shine. Also, keep the overall presentation short - about 1.5 to 2 minutes - and add some audio as appropriate. Your fans will love it. If you'd like to cozy up to more helpful videos, watch my latest lynda title, Photos for macOS Essential Training. Tons of tips to help you bring out your inner artist. Apple Notes in macOS Sierra has evolved into a very useful app for those who like checklists, reminders, and journals. And its integration with Photos for macOS has added a welcomed visual component that's seamless to use. 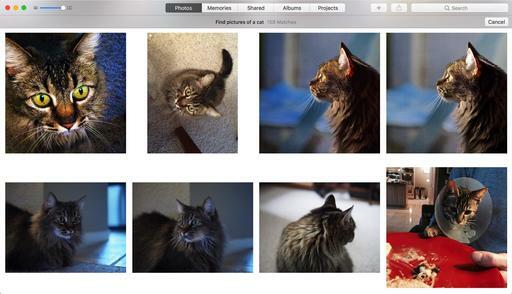 Images in your Camera Roll and in Photos for macOS can be easily added to an existing note, or used to create a brand new entry. They can be annotated with the Markup Tool, shared, and of course are propagated across all of your devices. Here's an short video that walks you through the steps (and possibilities). My typical workflow starts with taking a picture with my iPhone, sharing it to Notes, then annotating the entry for future reference. I can use this system for field notes, reminders, and ToDo lists. 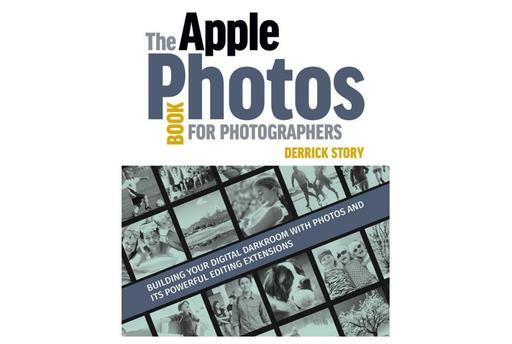 Explore the world of modern photography with my The Apple Photos Book for Photographers that features insightful text and beautiful illustrations. The latest version of Photos that shipped with macOS Sierra is the iceberg of imaging applications: simple elegance above the waterline, and a heavyweight beneath it. And if you join me for Photos for macOS Essential Training, I'll take you on a deep dive to explore its many wonders. And now that we have robust editing extensions, such as Luminar, wireless file transfer using Cascable, and seamless iCloud connectivity for sharing our images across all devices, Photos has evolved into an essential app, especially for mobile photographers. Here's the introduction movie to give you an overview of the course. Set aside some time to learn how you can incorporate Photos for macOS in to your photography life. You can share your thoughts at the TDS Facebook page, where I"ll post this story for discussion. Not long ago, I wrote about the frustrations of connecting our digital cameras directly to a Mac. But new software to the rescue. Cascable Transfer is in beta, and you can use it right now to send Jpegs, RAWs, or both to your macOS computer. The procedure is simple. Turn on WiFi with your camera, connect to it with your computer, then launch Cascable. If your camera is one that is supported, then the screen soon fills with thumbnails from the memory card. Choose the shots you want, decide if you want to bring over the RAW, Jpeg, or both, then initiate the copy process. You can send the files to a folder, import to Photos for macOS, or put them inside of Lightroom. I had the best success with folders and Photos. The Lightroom transfer still needs a little work. With Photos, my RAW files went right into the app, plus Cascable created an import album too so I can review all the shots that came into the app wirelessly. Everything was intact and looked great. Because wireless transfer isn't as fast as plugging a memory card directly into the computer, this isn't a method that you'd want to use for hundreds of RAW files. But for a dozen or so images, the 5-6 minute wait time is reasonable. You can try to beta version of Cascable now for free. And if you preorder your final copy, you can save 50 percent off the $14.99 price when it's released. I'm going to order mine now. 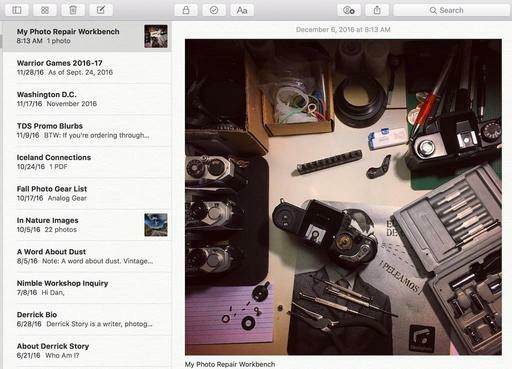 Apple's Photos for macOS app was designed from the ground up to help you organize, edit, and share your pictures and videos. While the interface appears simple, finding the hidden nuances of Photos is not so straightforward. There's more to this app than initially meets the eye. For photographers who are more than just casual snapshooters, or who are making the transition from Aperture or iPhoto, The Apple Photos Book for Photographers shines a light on the true sophistication of this app and the ecosystem it taps into. From the point of view of a working photographer, Derrick provides everything you need to know to get the most out of the imaging tools built into macOS and iCloud. This book is up to date with the current version of Photos that shipped with macOS Sierra. It includes discussions on Memories and object recognition, plus all of the tools that make this a compelling application for Mac-toting photographers. You can order your own copy directly from the publisher, Rocky Nook. Use coupon code DSAPPLE35 for a 35 percent discount. We recommend the Print & eBook Bundle that gives you the Kindle, iBook, and PDF versions, plus the lovely print edition. Most Mac users probably don't realize that Siri is waiting to serve as a personal photo assistant. All they have to do is ask. In my case, I hold down the CMD key + Spacebar and state, "Find pictures of a cat." In just a couple seconds, this appears on my screen. Lots of results from my asking Siri to find pictures of a cat. How does this magic work? It's the combination of object/animal/people/place recognition build into Photos 2.0 plus Siri on macOS Sierra. I haven't keyworded any of those images as "cat;" who has time for that? The algorithms in Photos can find instances of a cat on its own without my help. And by the way, none of them were keyworded or had descriptions. 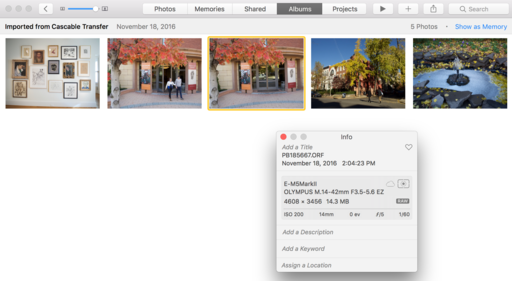 If you're using Photos on macOS Sierra, you really need to try this. It's a lot smarter than you may realize. 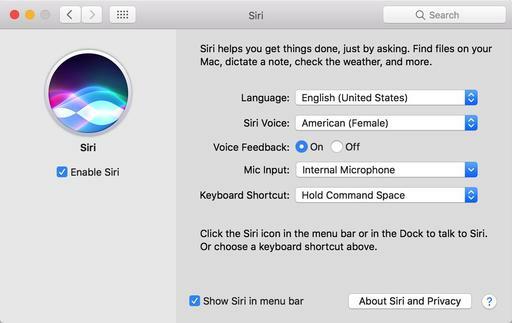 It takes just a few seconds to make sure Siri is set up correctly on your Mac. This excerpt is from the newly published book, The Apple Photos Book for Photographers, which is current for the latest Photos 2.0 and is now available in print and as an eBook. Each chapter leads off with an essay, then delves into artistic and technical content to help you improve your photography using Photos for macOS and its editing extensions. Here's the essay from Chapter 1. Thunderous applause is the last thing that you want to hear for the person who just spoke before you. This could happen in the classroom, at work, or even at a social gathering. Oh sure, on the outside you're happy for them. But inside, nobody likes to follow someone who has just knocked it out of the park. This plays out in may ways. How about the guy that replaced Michael Jordan after he retired from the Chicago Bulls? I bet that was fun. Movies try to do this with sequels. The first release was a smash, so let's do it again. Sometimes it works out. And then there's the world of software. Here we are with Photos for macOS, Apple's second act, following Aperture. Those who had stuck with it all of those years had come to love it. I didn't sense the same affection for iPhoto. But there wasn't much disdain either. 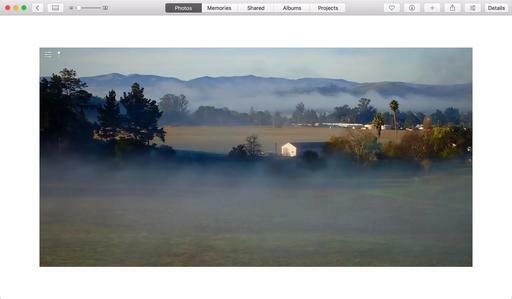 iPhoto was like the friendly neighbor next door who suddenly disappeared one day. You felt a little sad at first. Then you went back to watering the lawn. Apple is no stranger to turning over the cart. They've done it with hardware (you don't need a built-in SD card reader) and with software (you'll be working with Final Cut X now). And most of the time, they've pulled it off. And I think Photos for macOS is going to fall into that category. Then there are the folks coming to Mac computing by way of the iPhone. They have their hands full learning a new operating system and trying to figure out how iCloud works. I wrote this book for all of these people. For you. Because I think that you and Photos for macOS should get a fair shake. If the two of you spend some quality time together, I think you'll find a lot in common. I'm not saying that you're going to get married and have kids or anything. But the friendship could be rewarding. Someone once told me that a good relationship is one where both parties feel like they got the best deal. Photos for macOS is free. (Well, except that you have to buy a Mac to use it. That's an old Steve Jobs joke, by the way.) It can protect your valuable memories, even if your phone, tablet, or Mac is lost or destroyed. 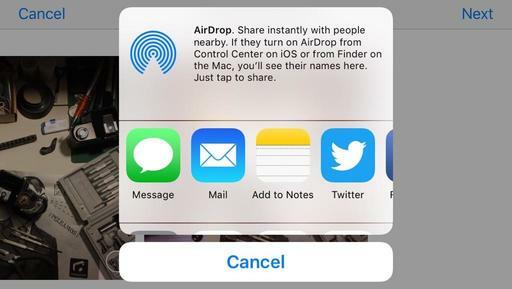 It automatically backs up your images to iCloud. That is, if you let it. Photos can make your pictures look better. Its editing tools are outstanding. And the third party editing extensions that are rolling in to the Mac App Store are taking creativity to another level. And just as importantly, Photos is friendly. It really is. All of that seems like a good deal to me. What does Apple get out of it? Well, if your learn to love Photos, you'll probably keep buying Macs, iPhones, and iPads. That's not bad for them either. Think about that boy who has to walk on stage after the kid before him gets a standing ovation. He probably has something wonderful to say. But you have to give him a chance. Now's the time to do that. I don't always have my best cameras with me when the great moments in life happen. And for those instances, thank goodness for plug-ins. More on that in a moment. First, a word about noise reduction. In my mind, Apple has never been very good at taming noise. 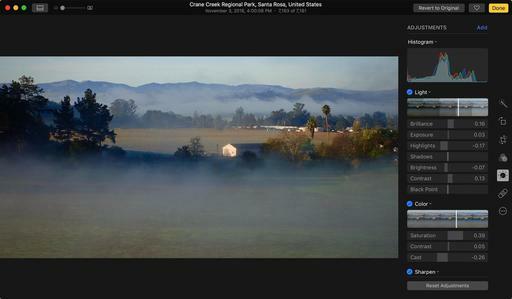 Even in their pro app, Aperture, that adjustment brick was ineffectual at best. And things haven't improved in Photos for macOS. Fortunately, we have third-party relief though editing extensions. And my current favorite is the noise reduction tool in Macphun's Luminar, that will offer its toolset to Lightroom and Aperture as plug-ins, and to Photos as an editing extension. Editing this image in Photos is fun, but noise is rearing its ugly head. The process I use now, is that I edit my image natively in my photo management app, in this case Photos, knowing that I can apply noise reduction once I'm finished with it. I then open the image in Luminar and apply my noise reduction. Reviewing the results with the before/after curtain. The fine-tuned picture then comes back to Photos, looking much cleaner. Finished image with noise reduction applied. You may be thinking that you rarely have to deal with noise using your Nikon D800. Yes, that's true. But many of life's moments happen when the D800 is back on the shelf at home. The image I'm using here was captured as a Jpeg with a compact camera that was in my pocket while I was driving on an errand. I had never expected to engage in serious landscape photography. Yet, there was the shot, and I was going to use what I had to capture it. I knew that in post I could probably clean it up. Between you and me, I like the picture. 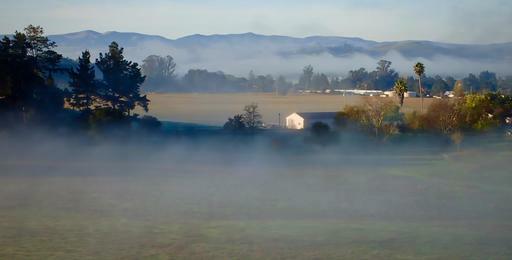 I decided to go for a painterly look, adding to the effect of the fog. But tomorrow I may feel differently, and possibly go back and do something else. The joy of non-destructive editing. I'm using Luminar for this type of work now because it can handle everything I need with just one editing extension or Lightroom plug-in. And I've tested it with Capture One Pro too, seeing great results. I have a beta copy, but you can pre-order your copy now for a discounted price plus bonus items. It's a great help for all types of images, especially those you did not plan to take. 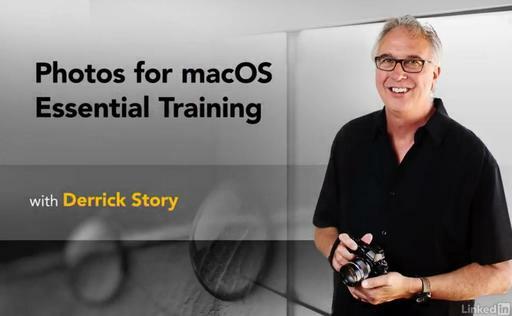 For hands-on tutorials, be sure to take a look at Photos for OS X Essential Training on lynda.com. I cover everything you need to know to get the most from this surprisingly powerful image management application. I forgot to adjust one of my cameras to the proper time here in Iceland. And those images were driving me crazy in my Capture One catalog because they were out of order. Unfortunately, I discovered that there was no easy way to fix this problem within Capture One. 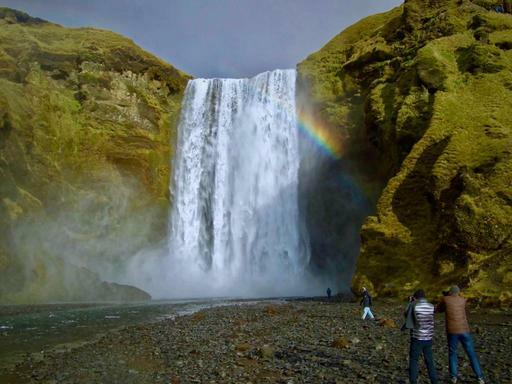 The original time stamp for this shot of Skogafoss Falls, Iceland was 7 hours off. I needed to fix that. Olympus TG-4 in Program mode. Image by Derrick Story. After a great deal of hunting, I discovered that I must leave the application for my fix. So, I turned to Photos for macOS, which does have a batch time stamp fix tool. The basic task went like this. Export images out of Capture One Pro. Delete the existing shots from the Capture One Catalog. Create a new library in Photos for macOS. Use the Adjust Date and Time tool in Photos to fix the time stamps. 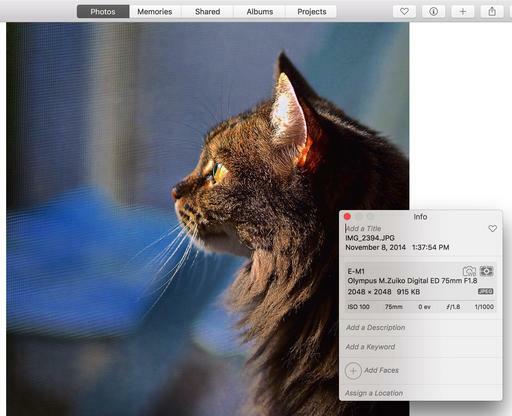 Export the images out of Photos and back into Capture One Pro. I was very careful along the way and backed everything up, just in case something went wrong. But I have to say that the entire process was a real hassle. In the future, I'm going to be more diligent about checking the time stamps on all of my cameras. I certainly don't want to spend time on this again. I've been working with a beta version of Luminar, the latest innovative photo application from Macphun. And I can tell you right now, this is software worthy of your attention. What they've done is modernize the approach to the image editing tools that we all need to use, but are not always sure how to implement them. 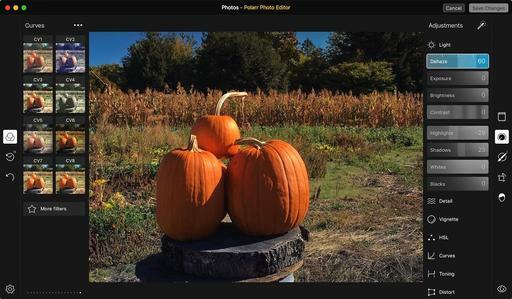 Macphun has made this easier by creating a Filter panel that contains the various adjustments we need, then allows us to combine these adjustments in any manner that we want. And for those combinations that we want to use over and over, we can save them as presets or workspaces. Additionally, we can use these filters with other tools in the application, such as brushes and gradient screens. So, while you're working, you're not thinking about how to create a mask, rather, you're just making the picture look better. For those who really want to dig in, there are layers that make sense, a history function that's easy to use, a cloning tool, and much more. 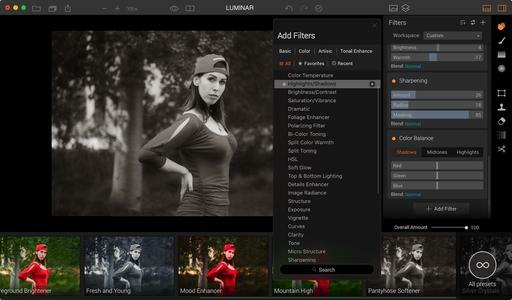 Plus, Luminar works as an Editing Extension for Photos for macOS, and as a plug-in for Lightroom, Aperture, and Photoshop. The icing on the cake is that it's going to be affordable too: $60. The application is scheduled for release in mid-November. Stay tuned here for updates, tutorials, and offers. I want to help us all learn this app together. This is terrific software that I think is going to add great enjoyment to your image editing. Want to see how easy it is to apply local edits to your images using Editing Extensions? Take a look at my new lynda training, Photos for OS X: Extensions for Local Adjustments. And for an overview of all of the great features in Photos, my Photos for OS X Essential Training will get you up and running quickly. I cover everything you need to know to get the most from this surprisingly powerful image management application. For photographers who are more than just casual snapshooters, or who are making the transition from Aperture or iPhoto, The Apple Photos Book for Photographers shines a light on the sophistication of this app and the ecosystem it taps into. Available as an eBook now, and coming to print later this year. If you're looking for a new goodie to spruce up Photos for macOS, you might want to take a look at Polarr Photo Editor, currently on sale for $1.99. You buy it as an app, but doing so also loads an editing extension that works great in Photos for macOS. First launch the Polarr app to make sure everything is working OK. Then close it. Next go to System Preferences > Extensions > Photos and check the box next to Polarr. It's now ready to go as an extension. Launch Photos for macOS and choose a picture to edit. 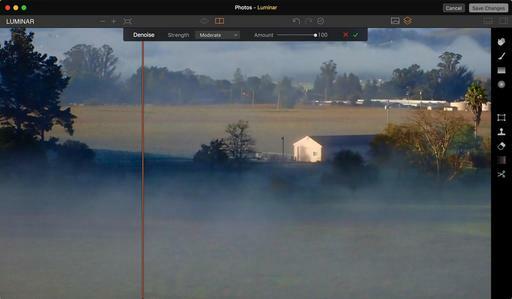 Select Polarr from the list of Extensions in Edit mode. Your image will open in the Polarr interface. There are numerous filters to browse on the left side of the screen, and plenty of adjustments on the right. The adjustments include all of the usual suspects for light and color, but there are plenty of surprises too, such as debase, distort, and grain. You can check your progress with the before/after button in the lower right corner. The most recent version includes copy/paste adjustments. That might not seem practical, since you can only work on one image at a time with editing extensions, but Polarr remembers your copied adjustments for the next picture you open with the tool. Nice. It's actually quite useful. There are plenty of tools and filters to explore here. And you certainly can't argue with the $1.99 sale price. Load it up this weekend and see what you can do with it.